1. Does the tool allow SD modelling? 2. Does the tool allow SR modelling? 3. Does the tool allow working with SD & SR models jointly? 4. Does the tool allow the construction of the models graphically? 5. Does the tool allow the construction of the models textually? 6. Describe how the elements are modelled and their flexibility (i.e., the elements can be moved and reordered). 7. Describe how the dependency links are modelled and their flexibility (i.e., dependencies are modelled with straight lines that can not be redirected). 8. Does the tool allow automatic organization of the elements? 10. Does the tool check SD models? 11. Does the tool check SR models? 12. Other checks provided by the tool (i.e., cross validation between SD and SR models). 13. Does the tool allow working with two or more models at the same time? 14. Does the tool allow to group models in projects? 15. Does the tool allow working with two or more projects at the same time? 16. What are the other functionalities that the tool provides? 19. Does the tool provides i* learning facilities? 20. Does the tool provide any examples for the users? 23. Has the tool been used for any case study? 24. Has the tool been tested in large models? 25. Has the tool any drawback when working with very large models? 26. Which is approximately the maximum size of the model (in terms of actors and dependencies) the tool has been used for? 27. Does the tool allow importing files? 28. Does the tool allow exporting files? 29. Does the tool allow importing/exporting data through an XML format? 30. Is the architecture of the tool published? 31. Does the tool allow the addition of other elements outside the i* framework of the tool? 34. Is there any internal documentation for programmers? TAOM4E supports a model-driven, agent oriented software development and, in particular, the Tropos methodology. It has been designed taking into account Model Driven Architecture (MDA) reccomandations. Working version is available for download on the website. Automated installation with dependency resolution through the Eclipse update manager. Extending the tool with later phases of Tropos methodology, providing support of the Tropos process, integrations with different reasoners, improving and extending the usability and the functionalities. If so, please specify how (i.e., by means of expandable elements). The actor elements can be expanded with the balloons containing the SR diagrams. If so, please specify how (i.e., dragging and dropping the elements into a drawing page). Dragging and dropping the elements into a drawing page from the palette or from the model tree. If so, please specify how (i.e., filling a dependency table). Users can change the name, size, color and font of an element. The element can also be moved, reordered, deleted, copied, pasted, highlighted, and labelled a symbolic attribute. All these actions are done graphically and by commands either on the menu bar or pop-up command window. One model element can be visualized on many diagrams. Different, partial views of a model can be represented in a diagram. The link can be moved, reordered, copied, pasted, and highlighted. The link can be rediredcted but can not be curved. If so, please specify how (i.e., the tool checks if all the SD dependencies are assigned). Yes, modelling is restricted by the underlying Tropos meta-model. If so, please specify how (i.e., checks if the SR links are correctly stated). No, but mixed SD/SR models are available. More models and more views on one model. The functionality is provided by the Eclipse Platform. 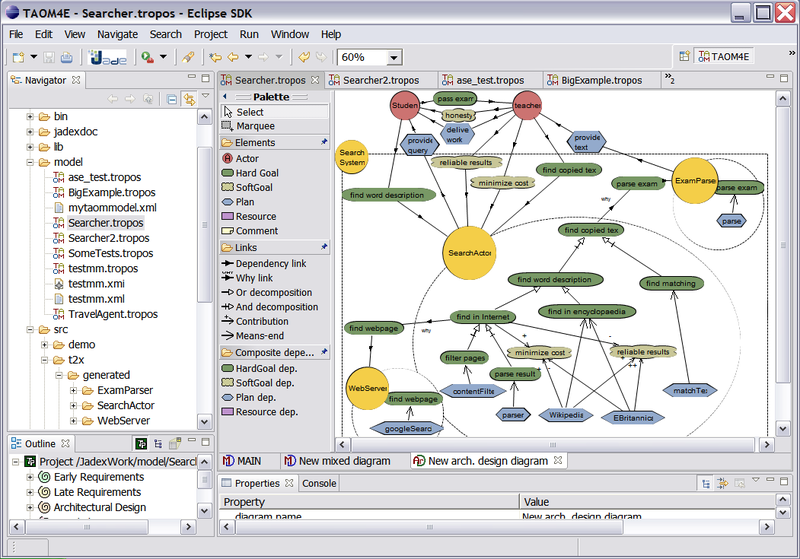 One *.tropos file can contain many diagrams related to the same model. Yes, The functionality is provided by the Eclipse Platform. If so, explain which ones (i.e., methodological guidance). If so, specify which ones. XMI, pictures of different fromats. Also, exporting functionality can be added as an external plug-in. If so, link to the DTD for the XML format if available. The technical report describes the architecture and the requirements for the tool. Created by novikau. Last Modification: Tuesday 19 of July, 2011 08:15:34 GMT-0000 by admin.